If you live in the Midwest, you’re probably familiar with Hy-Vee grocery stores. They have a marvelous meat counter with all kinds of grab & cook options. One of those is Salmon Burgers. The only problem? The price. Fresh Salmon is never “cheap” but there are great sales now and then as different varieties come in season, and there are always great specials around Christmas and Lent. That’s when I like to make these Salmon Burgers. First, I check to see if the store has odd bits at a discount (or if I do in my freezer from trimming fresh salmon) because it will all be chopped up anyway. If you can’t get fresh at a great price, try frozen – and check Aldi. You might even want to consider Canned Salmon, which is a great option for wild caught Alaskan Salmon. I just love the combination of flavors I’ve come up with here, but you’re free to add in all kinds of goodies, sauces or condiments or just go simple. Changes in ingredients or different types of Salmon may slightly change the moisture content. Form a small bit of the salmon mixture in your hand and if it holds together, you’re good to go. If it’s crumbly add a bit more moisture. If it feels too wet, a touch more breadcrumb will help. Working quickly to keep as cold as possible, cut the salmon into 1″ chunks. Take about a quarter of the salmon and add to a food processor along with the mustard. Process until the mixture becomes a paste, stopping to scrape down sides. Add the remaining salmon and pulse off and on until the salmon is chopped into fine pieces. Don’t over process into a paste but make sure there are no large chunks. Remove to a bowl. By hand, stir in egg, breadcrumbs (start with half a cup, add more after you’ve added the rest of the ingredients if the burgers seem very wet) green onions, peppers, garlic, lemon juice, soy sauce, salt, and pepper. If grilling, brush the patties with butter or oil and grill about 4 minutes the first side (don’t turn too soon or they won’t be firm enough to remove from the grate) then turn and finish for a moment or two. If using a pan, place butter or oil in a nonstick skillet and heat to medium-high. When the foam subsides or oil is hot, cook burgers for two to three minutes per side, turning once. Doneness can be checked by making a small cut with a knife, but be careful not to overcook. You know I’ll be bringing this to our Throwback Thursday #31 Link Party, hosted by Quinn of Dad What’s for Dinner, Meaghan of 4 Sons are Us, Alli of Tornadough, Carlee from Cooking with Carlee and Moi! That’s right – me! Of course, I can’t miss bringing this to Fiesta Friday #112, hosted by Angie and cohosted this week by Natalie @ Kitchen, Uncorked and Hilda @ Along The Grapevine. Wow, 112 consecutive weeks! This entry was posted in Click here for Bargain Meals, Click here for Fabulous Food Posts and tagged Bargain Meal of the Week, Burgers, Fish and Seafood, Freezes Well, Frugal Hausfrau, hy-vee, Mark Bittman, Salmon. Bookmark the permalink. This looks so amazing love salmon and it is a great idea to make burgers out of it. Loved all the collection of your recipes posted for mother’s day.What a wonderful treat .Have a great weekend! Hi and thanks so much! Salmon is my favorite fish and these burgers are a fun spin on it. I like the addition of red pepper. I have made them with a bit of ricotta cheese instead of breadcrumbs. Your version looks yummy, much better than those you get in a store. Thanks, Liz! I am going to have to try the ricotta cheese – that would make them lower carb! 🙂 I just realized I ha ven’t been by for awhile, so I’m glad you stopped by to comment. I love salmon burgers and patties in general. I think they are one of my favorites and do not make them often enough. Thanks for sharing. lol, and thanks!! We loved them! This looks so incredibly good! I’m definitely going to try this. I love shopping at Hy-Vee (and Aldi!) You named my two favorite stores! I haven’t tried Hy-Vee’s salmon burgers though. Now I don’t have to, I’ll just make these instead! Hi Petra – Salmon is my fave fish and I don’t want to let a bit go to waste! This looks fantastic! Iv’e eaten so many bad salmon burgers that have made me a bit scared to try to make it, but this looks fab! I never had a lot of luck making salmon burgers – your tips are very helpful and encourage me to give them another try. Mollie– this look luscious! We’re trying to eat more fish and always looking for yet another way to cook salmon. thanks! Thanks, Rhonda! I’m smack dab in the midwest and it’s easy to forget to eat fish right in beef/pork country! These are nice, too, because even those who’d rather not eat a fillet will typically enjoy a salmon burger. Canned salmon is quite a bit wetter and doesn’t need to cook as long – I think instead of an egg (because I’m concerned about raw egg) I’d use a little mayo for the binder, a tablespoon or so, and you’ll probably need to use the larger amt of bread crumb. 🙂 Smoked Asian salmon – yum! yummy. 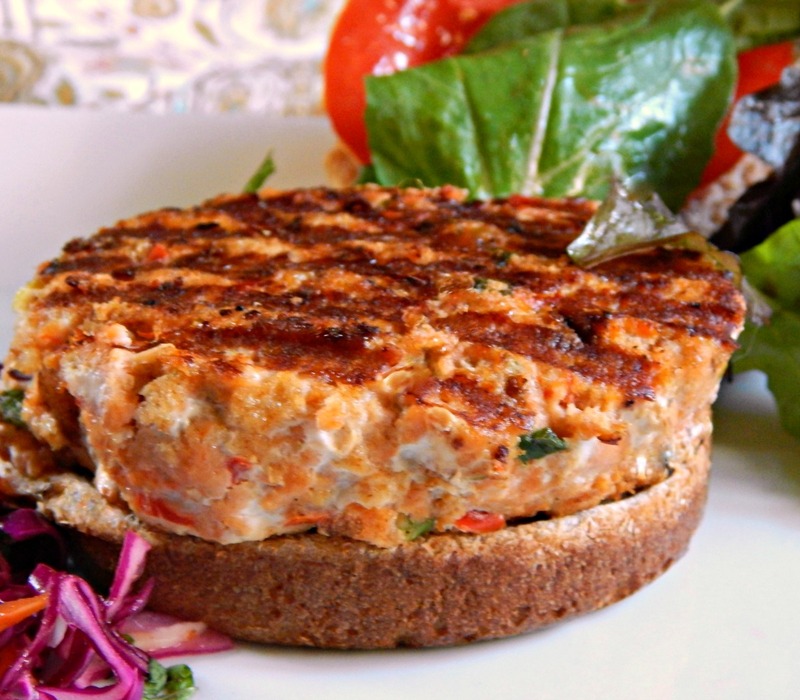 i love salmon – these burgers look terrific!. great idea! I do love salmon and never thought to make burgers out of it. This looks so good, too! I’ve never tried salmon burgers but I like salmon so next time I buy a side and trim it up, I’ll chop up the bits and give them a try.